"Powerful with an Instant Start"
Ownpages's powerful browser console for users and operators answers common questions associated with a PBX, such as "What's her extension? ", "Is he available? ", "Where is he now?" and "What is the dial code for X feature?". It gives to even analog phones the functionality of expensive SIP phones and key phones at the price of free! This with the bundled Flash based phone lets you start using your PBX in an instant. Provides click-to-dial using names, not extension numbers. Provides presence information (is person available?). Shows presence integrated over all a person's extensions. Provides PBX features without needing to remember dial codes for them. Provides advanced functionality to low cost analog/sip extensions. 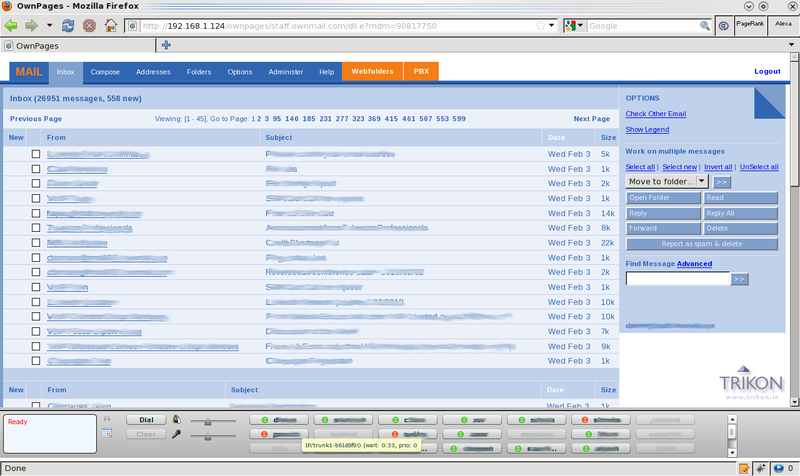 Makes your browser your PBX extension. No software to download and install. Integrates with OwnMail for common login. Integrates your mailbox and PBX addressbook. Is currently usable only within your LAN, not as a remote extension or with a hosted PBX. Flash uses only your default sound device, by extension so does FlashPhone. Flash will ask for use of microphone and camera. Make choice permanent. Flash Phone is beta software.